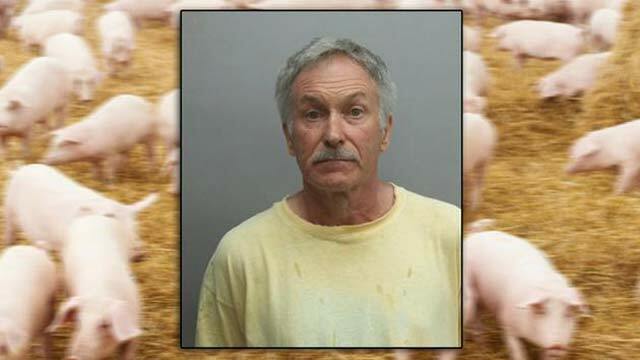 Larry William Henry, 64, was found drunk and naked inside a barn with several market weight hogs. Henry had been banned from this barn in March 2011, but decided to come back anyway. Why did Hengry ignore the ban? “I just like pigs,” Henry told officers when asked why he was there, Lancaster Online reports. Henry also admitted to drinking a six-pack of “Hamm’s beer made by Miller Brewing Company” while hanging out with the hogs. Henry says he doesn’t have a sexual preference for hogs, but that he just enjoys their company. Henry is now out of jail on a $25,000 unsecured bail. He’s due back in court later this month on charges of indecent exposure, criminal trespass, defiant trespass and public drunkenness. Tyrone Walks Up to a Group of Men, Gets Punched in the Face! Copyright © CRAZED.COM, All Rights Reserved.